A screenshot from Vic Lombardi’s interview with Yariv Ben-Naim. Altitude Sports Radio and Altitude TV host Vic Lombardi recently exchanged numbers with Yariv Ben-Naim, 20, at a Special Olympics clinic hosted by the Denver Nuggets at Pepsi Center earlier this month. Ben-Naim, from Monument, has competed in the Special Olympics since 2011 in bowling, basketball, golf and soccer. He combined his favorite sport — basketball — with his passion for numbers as sport statistician for the Palmer Ridge High School basketball team for four years. He also- takes stats for the TriLakes YMCA basketball program. Ben-Naim impressed Lombardi at the Jan. 18 event with his knowledge of Nuggets trivia, including box scores, their road record and players’ birthdays. In fact, it was a birthday that led to Lombardi’s interaction with Ben-Naim. When Lombardi told Yariv his birthday, the student at UC Colorado Springs, whom Lombardi affectionately refers to as a “computer processor,” right away knew what day of the week it would fall on. That led to more statistics and even a guest spot for Yariv on Lombardi’s radio show, where — not surprisingly — trivia took center stage. 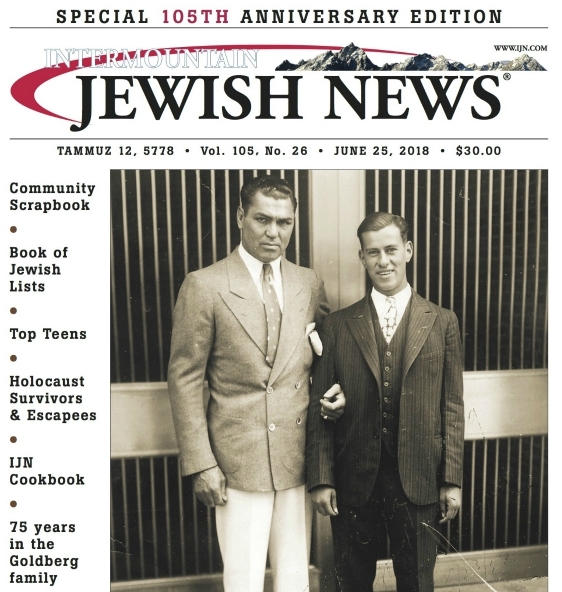 In a recent phone conversation, Lombardi told the Intermountain Jewish News that he was so impressed by Ben-Naim’s “passion for sports” and “knowledge of the game” that he even invited Yariv to shadow him during a Nuggets broadcast. To make that dream a reality, Yariv, who completed three years at Pikes Peak Community College, is now studying sports management at UCCS. Ilanit shared that Yariv has often been told what he can’t do because of his autism, but he hasn’t allowed that to stop him from pursuing his goals. Make sure to tune into Altitude TV on Feb. 13 when Yariv will be shadowing Lombardi as the Nuggets take on the Sacramento Kings. In the meantime, check out the video that Lombardi tweeted of his chat with Yariv @VicLombardi.